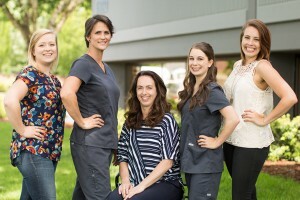 Dr. Tiffany Altilio has been in practice since May 2009. “My daughter inspired our practice name, which is fitting as there are lots of bridges in the greater Portland area. Years ago we lived in Minnesota where there were many bridges as well. My daughter would hear the word bridge over and over, so she came up with the name.” At Bridge to Health Chiropractic, we love working in such a lovely, scenic community as Hillsboro! Welcome to Bridge to Health Chiropractic! Our purpose at Bridge to Health Chiropractic is to courageously empower people to transcend barriers so that they can heal and realize their full potential. Dr. Tiffany enjoys seeing patients of all ages and backgrounds. As a family practice, she cares for infants, seniors and all ages in between. She also has a particular interest in offering prenatal and pediatric chiropractic care. She will even make home visits for new moms and babies. Our patient base is also comprised of many engineers or spouses of engineers as we live in a major Intel hub! These analytically minded patients are particularly interested in how things work, such as our Insight Substation. “I needed a whole new way to communicate when I moved into this neighborhood,” says Dr. Tiffany. Dr. Tiffany is passionate about helping her patients live abundantly. I want to see that sparkle return to people’s eyes. That’s the sparkle that you have when your nervous system is on point, and you’re living well. At Bridge to Health Chiropractic, we are passionate about nurturing a healthier community in various ways. Dr. Tiffany loves talking to elementary school students and teaching them positive body-image and self-confidence through her Stand Strong program. During the holiday season, you can drop off a toy to be gifted to a child in the foster care system in Washington County. We also love to sponsor local High School sports teams! With chiropractic care, you and your family can experience optimal health. Contact us today to schedule a convenient appointment!